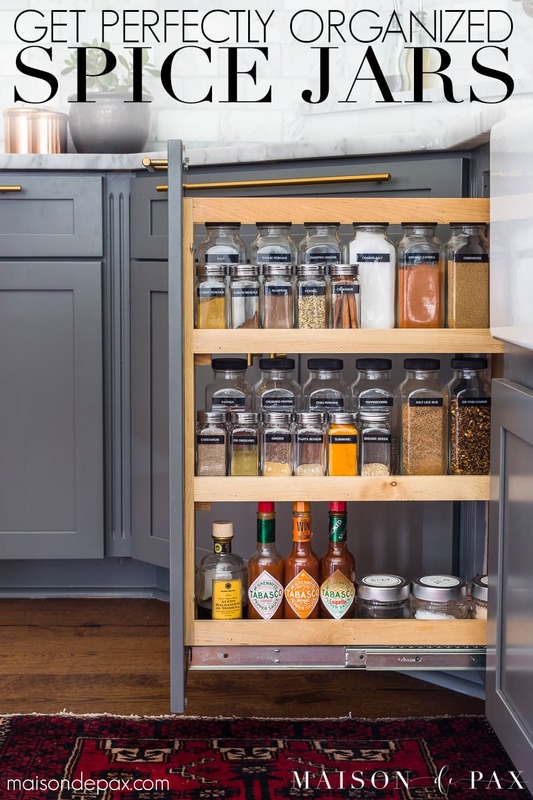 Looking for the best way to organize your spice cabinet? 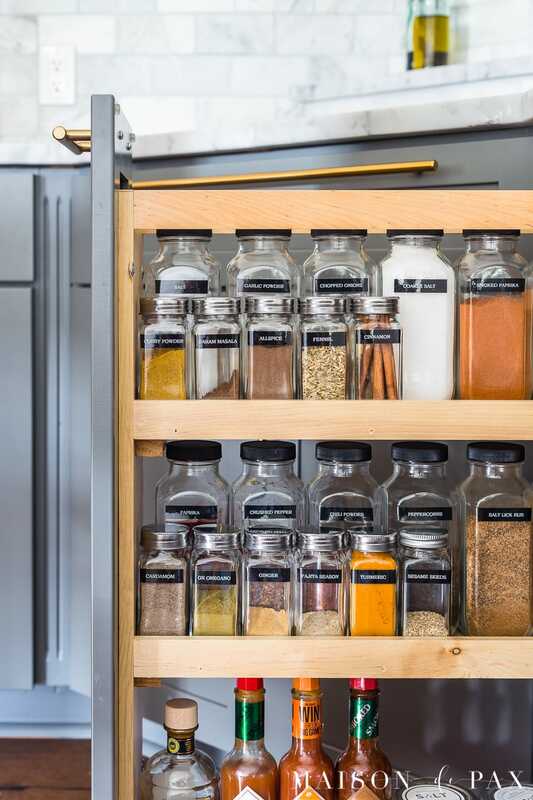 Find out how to organize spices efficiently and beautifully! And if you’re like me and have lots of littles at home this summer (or if you’re finding this post in January and you’re ready to get your kitchen organized for the new year! ), this is such a great little organization project because it’s quick, easy, and makes your kitchen so much more functional. 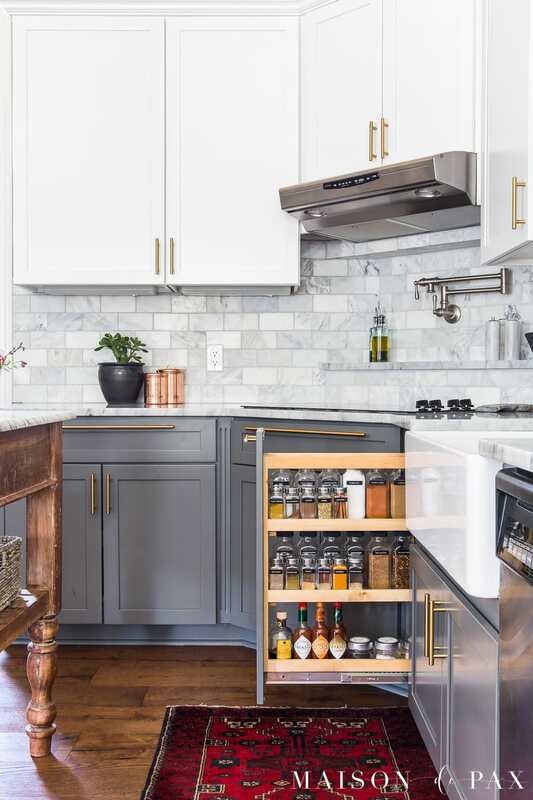 Give yourself an empty kitchen counter and about an hour, and you can get your spice cabinet organized, too! 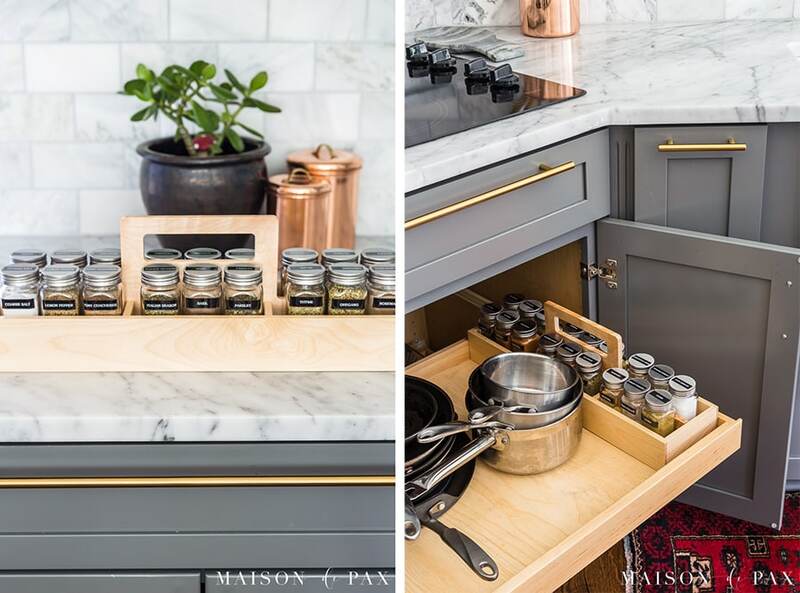 Note: you will want to make sure your spice jars make the most use of your space. If your shelf is 5″ deep, then try to find a combo of bottles that adds up to as close to 5″ as possible so you aren’t wasting space. My shelves are just ~4.5″ deep, so the combo of these small bottles (which are ~1.8″ square) and these large bottles (~2.5″ square) were just perfect. The larger bottles I bought do not have shaker tops. I don’t mind at all as I don’t really need them and this allows me not to have to remove the shaker top when I need to measure out a certain amount. I have these beautiful measuring spoons, and all but the largest fits into the jar opening. 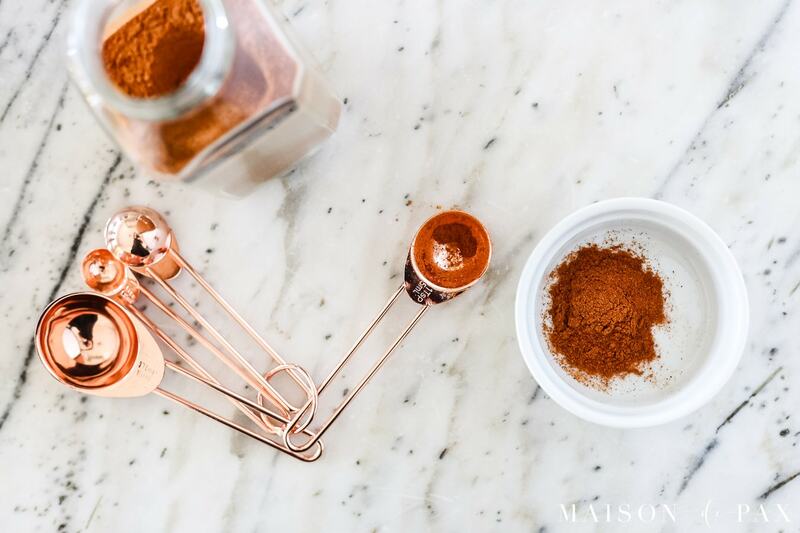 I also love these copper measuring spoons because I think the elongated shape might allow all of them to fit into the larger spice jar openings. 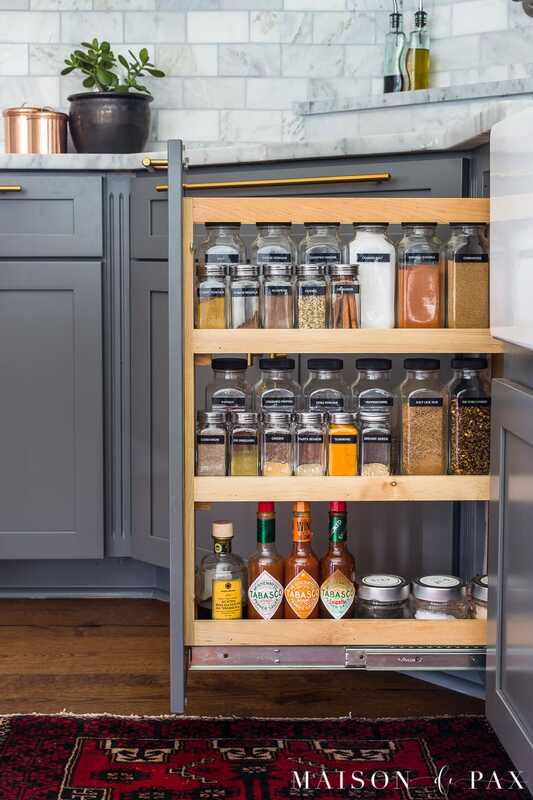 While I have a spice pull out and an extra caddy for portability (you can see more about that here), if you need to store your spices in a cabinet, you might consider a spice cabinet organizer like this to help you store multiple tiers of spices or a caddy that lifts out for portability and access. And if you need to store them in a drawer, then I love the tension rod trick: use tension rods like these to divide your drawers and even to lean the spice jars against to make the labels easier to read. For more kitchen organizing ideas, see my tips for a functional kitchen here. And for more details on our kitchen, see this post about our remodel or shop the look below! I love your new property and the house will be nice when you put your ideas into action, it will be a great place for the kids to grow up in also. This is very exciting for you and am so happy for you. Haha! I’d be tempted to do so myself. Thanks for your comment!